I harvested my parsnips last week. I ended up with quite a nice crop, best one yet. The first use was in a bread pudding I made for Thanksgiving, and it was one of our favorite sides (although nothing ever compares to the sweet potato casserole). 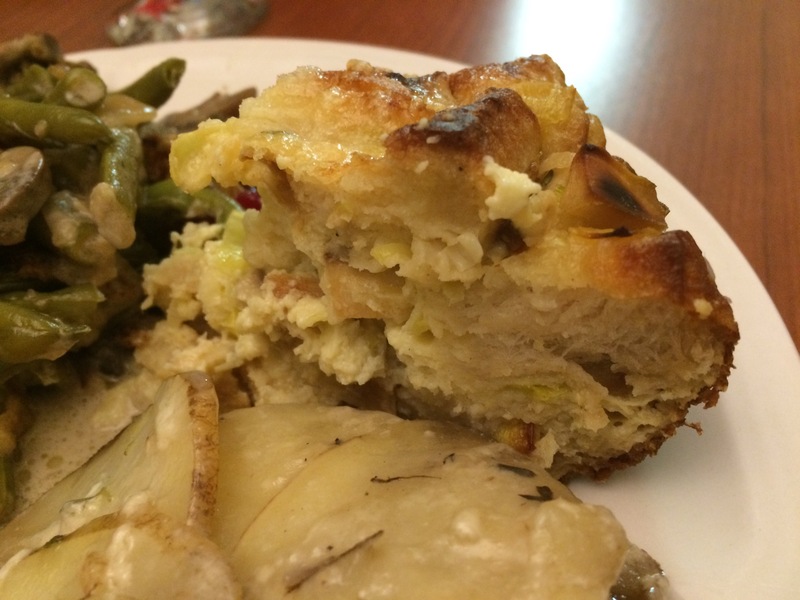 The bread pudding would also be good for a brunch, so I don’t feel the need to save it solely for a Thanksgiving dish. So I might as well go ahead and post it now. Preheat oven to 425 degrees. Drizzle parsnips with oil, and season with salt and pepper. 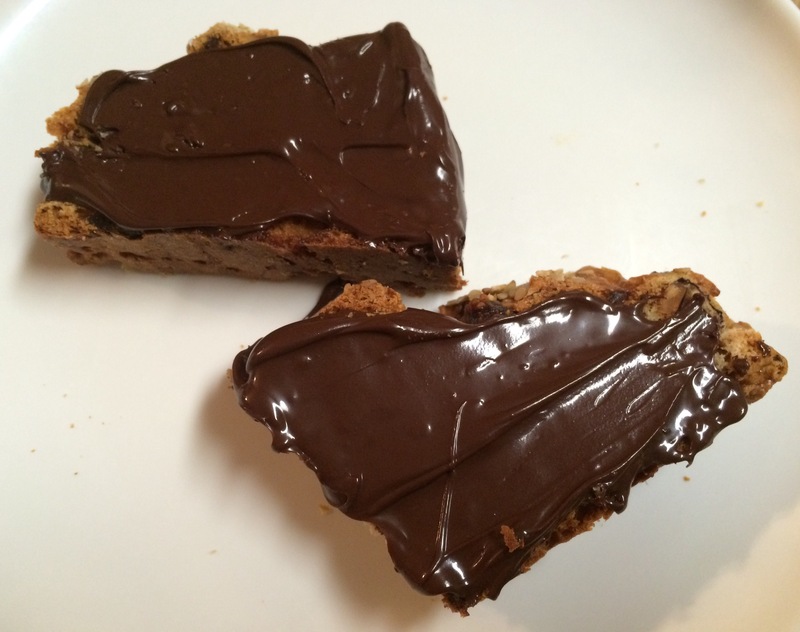 Arrange on a rimmed baking sheet. 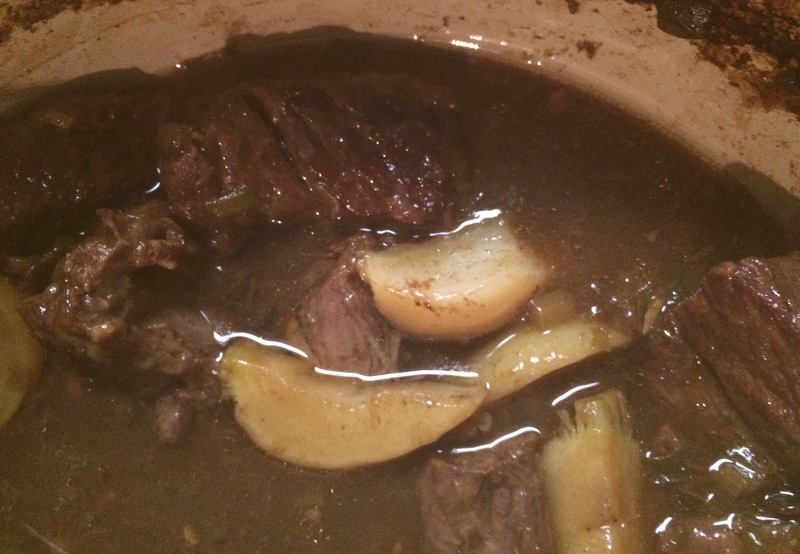 Roast, shaking occasionally, until caramelized and tender, 23 to 25 minutes. Let cool. Reduce heat to 375. Heat 2 tablespoons butter over medium heat in a medium saute pan until melted. Add leeks, and cook, stirring occasionally, until tender, about 5 minutes. Remove from heat; add wine, and return to heat. Let simmer until reduced, 1 minute. Add thyme, and remove from heat. Stir in roasted parsnips. Cover loosely with parchment, then foil, and bake until golden brown and puffed, 50 minutes. Remove parchment and foil. Sprinkle with remaining 1/4 cup Parmesan, and return to oven. Bake for 10 minutes more. Turnips from the CSA and beef from our local butcher; the makings for a dinner the men in our family would really enjoy. I saved the turnip greens for a gumbo – that came out well, but not outstanding, we all decided it was good but not blog-worthy. But I love being able to use all parts of the vegetables that come in my CSA box. But back to the turnips themselves. They melded with the meat, it was a luscious and satisfying dish. There was not a drop left in the entire pot when dinner was done. That makes me very happy! 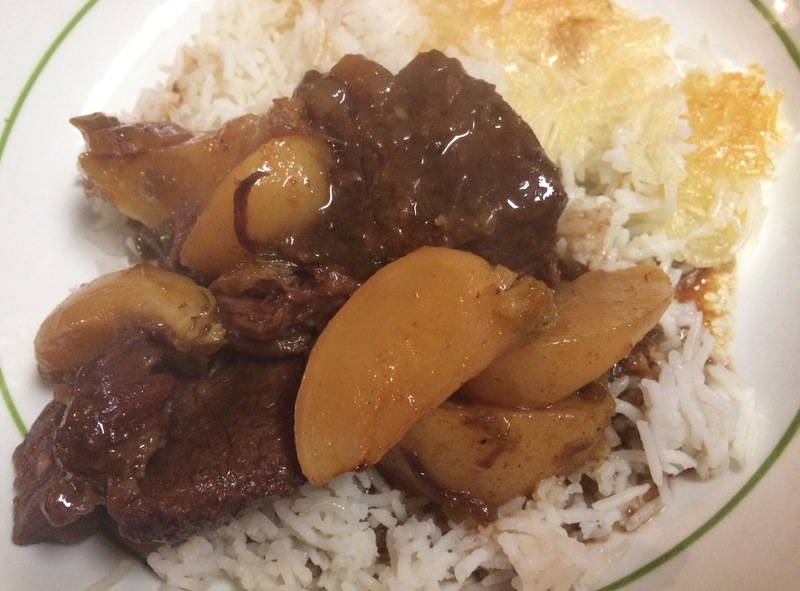 As you can see, I served this with Persian rice – I was outvoted by the overwhelming desire of my “diners” to have tadig – the crispy rice that comes with good Persian rice. But, really this should be served with a sticky rice. Position a rack in the lower third of the oven and preheat the oven to 325F. In a large dutch oven, heat 2 Tbsp of the oil over medium heat. 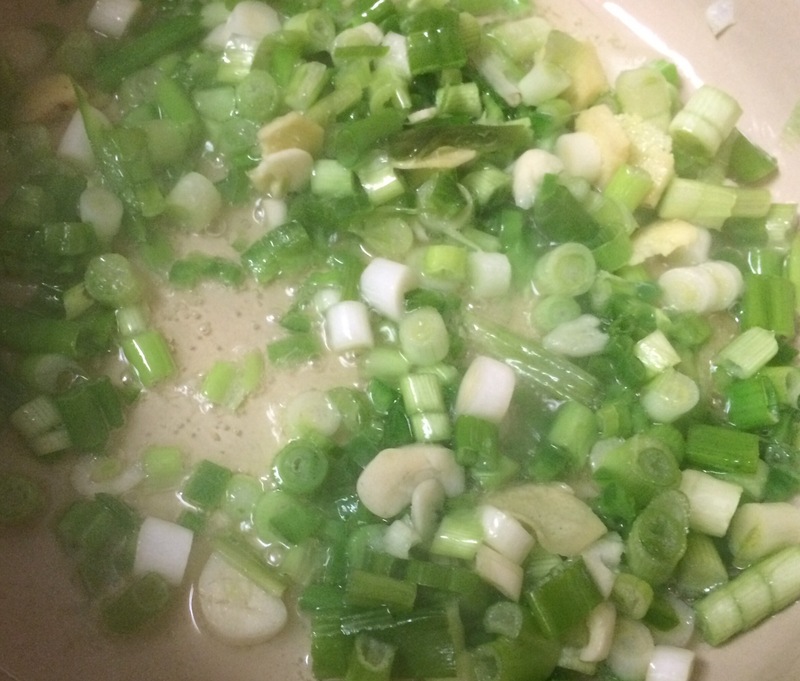 Add 1 cup of the scallions, the garlic, jalapeno and ginger and cook, stirring, until tender and fragrant, about 3 minutes. Do not allow the garlic to burn. Use a slotted spoon to transfer the mixture to a plate. 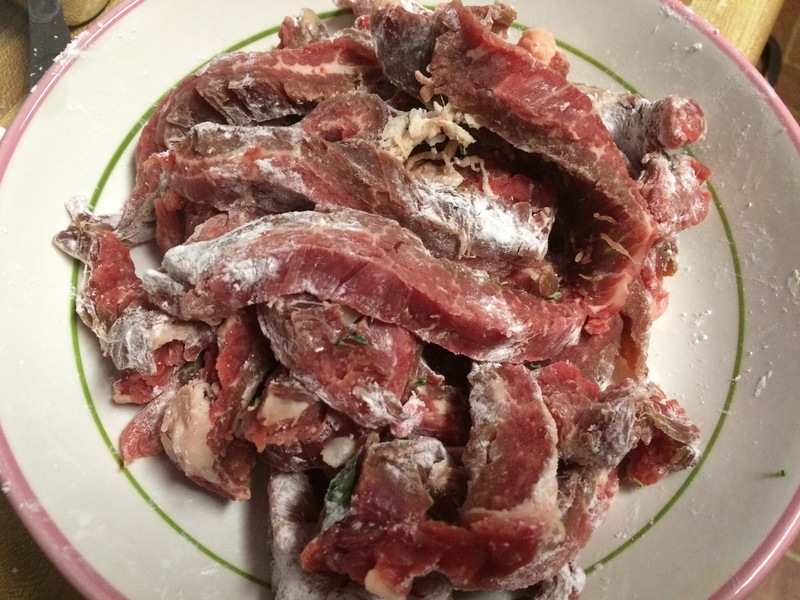 Season the beef generously with salt and pepper and toss it in the flour til evenly coated. Return the pot to medium-high heat and add the remaining 1 Tbsp oil. Working in batches, brown the meat on all sides, 6-8 minutes per side. Using tongs, transfer the meat to a rimmed baking sheet. Pour off all but 2 Tbsp of the fat from the pot and return to medium-low heat. Add the brown sugar, star anise, cinnamon stick, and five-spice and stir until fragrant and the sugar is dissolved, about 1 minute. Add the wine and stir to loosen the brown bits stuck to the pot bottom. Bring to a simmer and reduce the liquid by half. Return the onion mixture and the meat with any accumulated juices on the baking sheet to the pot. Add the stock and soy sauce and bring to a boil over medium high heat. Cover with a tight fitting lid, transfer to the oven and braise for 2 hours, stirring the meat once after 1 hour. After 2 hours, add the turnips to the pot, stirring to submerge them in the liquid. Re-cover, return to the oven and cook until the turnips are tender when pierced with a fork, about 30 minutes longer. The meat should be very tender. Taste and adjust seasoning. 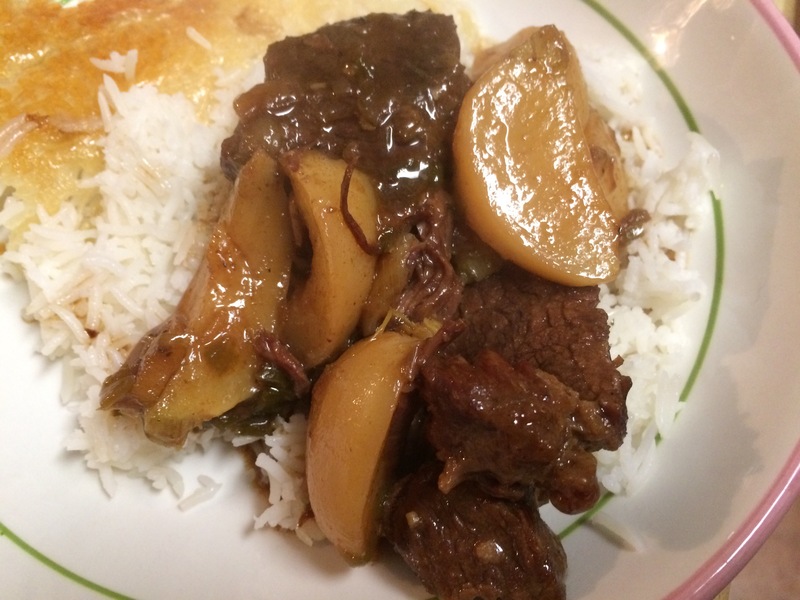 Spoon the rice into shallow bowls and ladle the stew over the top, serve and enjoy! Flipping through the channels one night I came across The Great British Baking Show, specifically the Bread episode. I was hooked. 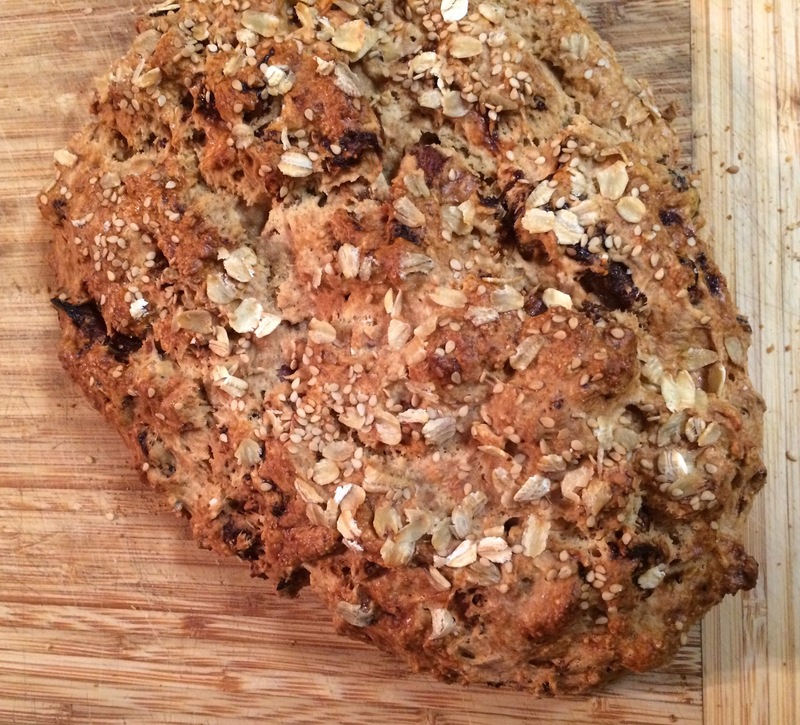 But also, I saw some amazing soda breads being made. 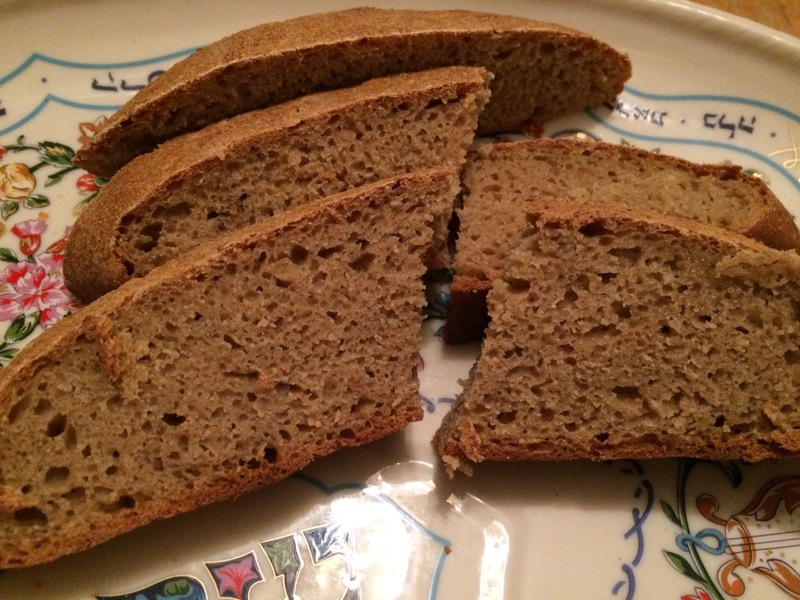 First on my list to try was the Fig and Hazelnut Rye Bread. I went to every store around me, but was not able to find rye flour. Since I did not want to wait to order any through the mail, I decided to make a whole wheat version. I made larger loaves, so I had to adapt the cooking time as well. The bread was a hit for breakfast with some butter and jam. My husband and I have also been seen putting nutella on it as well. The evening after I made these, we had a beautiful Delaware sunset. Preheat the oven to 350F. Line a large baking sheet with parchment paper. Rub the flours, sugar and butter together to form bread crumbs. Stir in the bicarbonate. Toast the hazelnuts, allow them to cool. Chop the figs and hazelnuts. Add the figs and hazelnuts to the flour mixture, stirring well. Gradually add the butter milk until you have a fairly wet dough, you will likely need more than 600ml but less than 700ml. 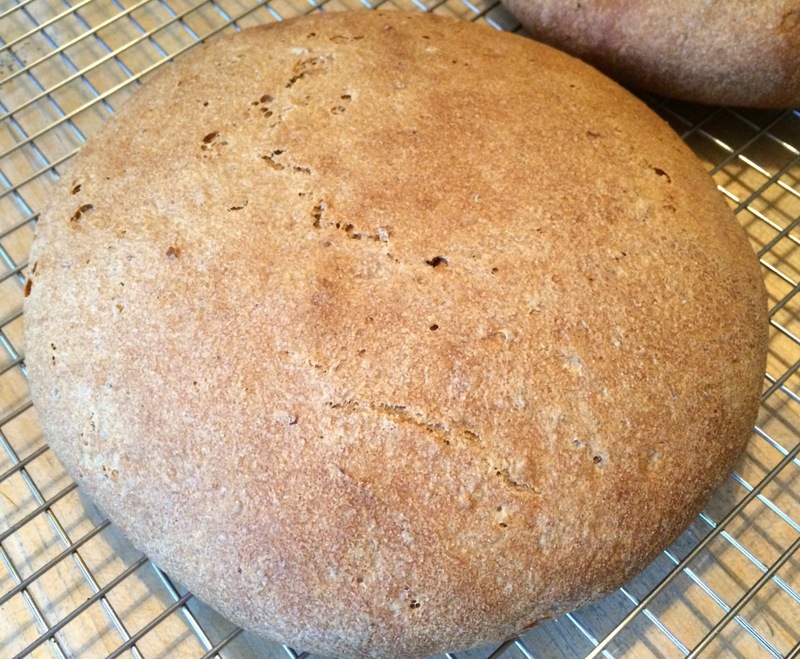 Take half the dough and form into a large oval loaf on the parchment-lined baking tray. Repeat with the other half of the dough.Brush with beaten egg and sprinkle the seeds and oats on top. Bake for about an hour or until the bread is baked through and the crust is nicely browned. Let cool on wire racks. Enjoy! One of the treats we get in our CSA basket is locally grown english cucumbers. 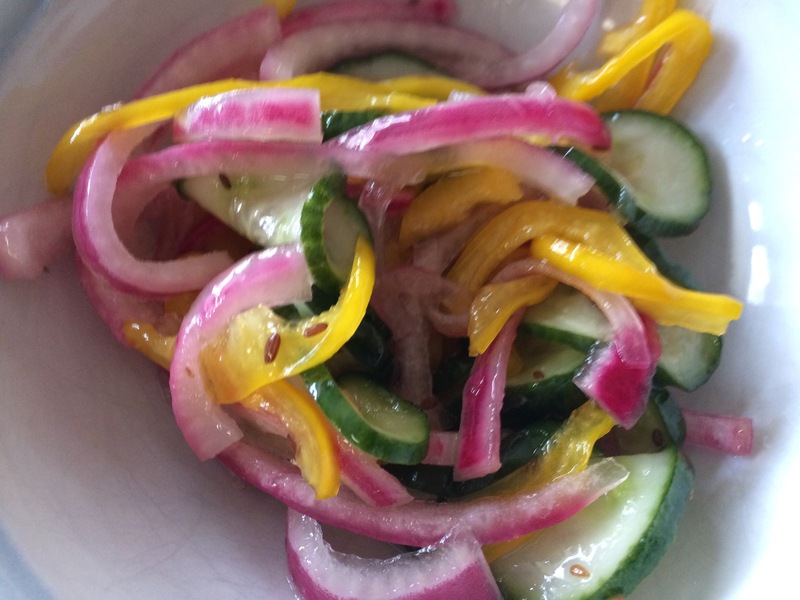 I loved pickles and pickling things, so I decided to try a riff on Trisha Yearwood’s cucumber salad. As usual, the pickling liquid cooked up really fast, but it also created a great design in the pot. Check it out – look at that inner circle, it’s perfect. I tasted it a couple of hours after I put it in the fridge, it was ok. It really does need the overnight to really pickle. It was great the next day! Refreshing and light with just the right amount of ‘pickle’! Place the cucumbers, onion and bell pepper in a large bowl. In a medium saucepan over high heat, bring the vinegar, sugar, dill seeds, vegetable oil and 1 teaspoon salt to a boil, then remove the pan from the heat and allow to cool, about 20 minutes. Toss the vegetables with the liquid mixture. Time to use another section of my giant crookneck squash. I roasted about 2/3 of the neck and since I only needed 2 1/2 cups of pulp, it was still too much , so I will need to find another use for the couple of extra cups of pulp. Since even just the plain roasted pulp was delicious, that will not be a difficult thing to do. 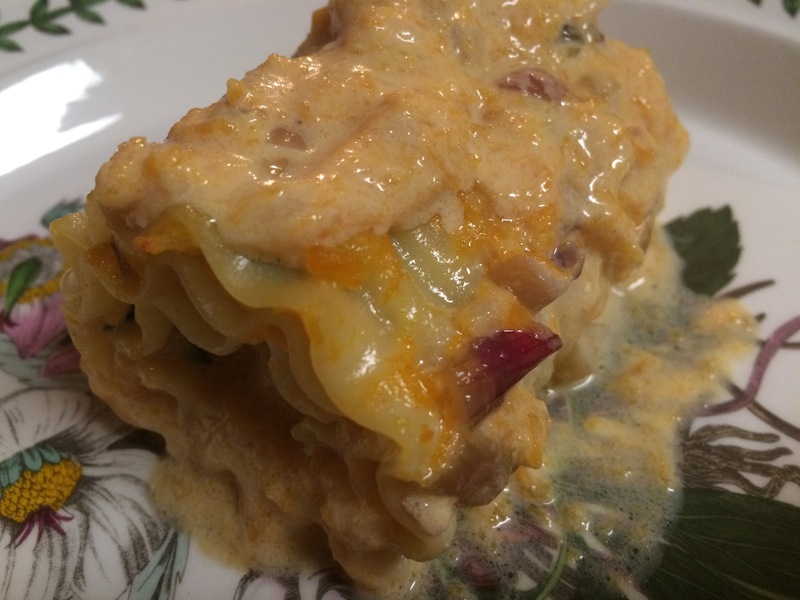 I used the squash in place of butternut for these lasagna roll ups. 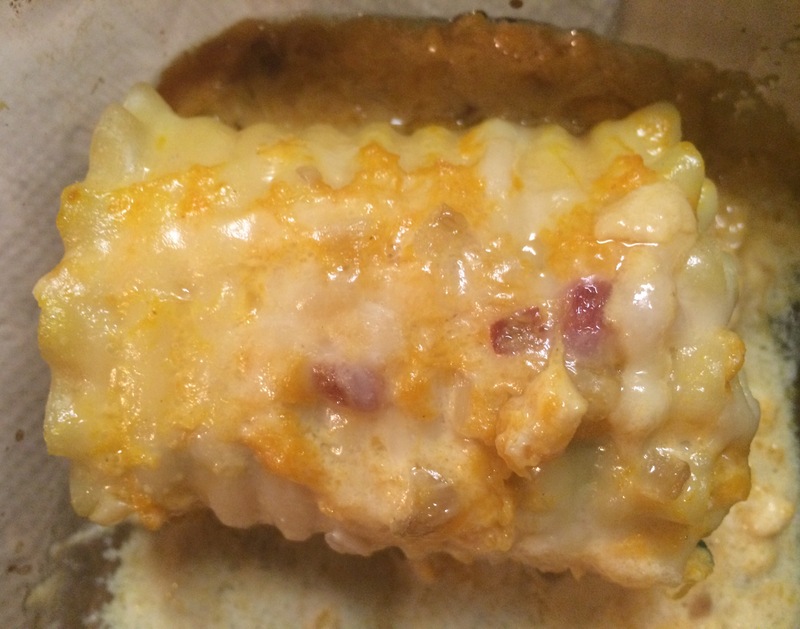 The squash is the base for both the filling and the sauce. Prepare the squash ahead of time (you can even do it the day before and refrigerate it until ready for use). Cut lengthwise, with skin still on, remove seeds and roast the squash, cut side down at 350 degrees until tender and a knife goes through with ease, close to an hour. Let it cool, then scoop out pulp. Mash 2 cups of the squash pulp into small chunks, making it easy for spreading. Add in ricotta, egg, cheeses,grated garlic, zest, salt and pepper. Mix together well, then fold in spinach until incorporated. In a medium-sized skillet, saute the shallots in the butter with the sage leaves until slightly golden. Remove the sage leaves, then add the broth and whisk in the ½ cup of the well pureed squash that was reserved until nice and smooth on low heat. Whisk in the cream and add the grated parmesan cheese, salt and pepper to taste. Set aside. Place a little sauce on the bottom of a shallow baking dish. Spread about 3 tablespoons of filling on each cooked lasagna noodle. Roll up and place them seam side down in the baking dish. Spoon sauce on top of each lasagna roll up, plus grate a little parmesan cheese on top of each. Bake uncovered in a 350 degree oven for 15 to 20 minutes, sauce will be set and top will be slightly golden. Serve topped with some sauce and enjoy!! For first Shabbat after the election and I decided that I would feed my soul by baking bread. A good long process of baking bread…a sourdough. And I would celebrate not only diversity, but the diversity within my religion and make Bereketei – Ethiopian Sabbath Bread. One of the first steps was to toast some fenugreek seeds. I never cooked with fenugreek seeds before. I use dried fenugreek leaves in Persian cooking, but not the seeds. 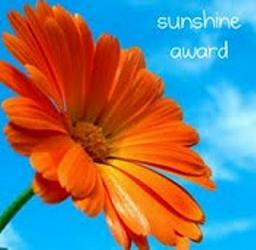 Well, I was in for such a pleasant surprise – when I put the toasted seeds in the grinder with some salt, a wonderful aroma rose up as I the grinder whirred! I called my daughter over to smell it, and she said it smelled like matzoh ball soup. You know what? She was right, that was exactly what it smelled like! And it is what the house smelled like as the bread baked. Warm and comforting. A note: this is an all-day baking process that starts the night before, so be prepared. Feed your sourdough around 12 hours before you intend to start baking. Place the flour in a large bowl, stir in the water and let sit for 20 minutes. While that sits, make the seed mix. Important – turn on the exhaust fan and toasting the fenugreek seeds in a small pan over medium heat. The seeds will turn darker brown and turn fragrant (do not touch the seeds with your hands before they are mixed with the salt or it will become bitter.) 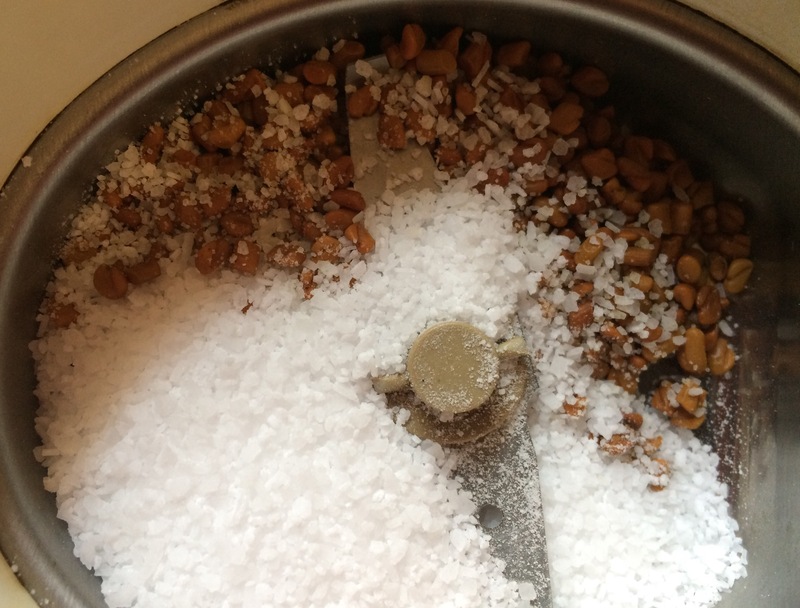 Let the seeds cool and place in a spice grinder with the salt until coarsely crushed. Set aside. Add the starter and the seed mix to the flour mixture. Turn out onto your work surface and knead until until it is well mixed and fairly smooth. Place it in a warmed, oiled bowl, cover with plastic wrap and let it ferment for 2 hours. Place parchment on a large baking sheet. Divide the dough in half and shape into tight round loaves. Cover with plastic and let rise until tripled in size about 5 hours. About 1/2 hour before baking, place a baking stone in the upper 1/3 of the oven and heat to 425F. Turn on the exhaust fan again. Bake for 35-40 minutes.After the first 20 minutes, rotate the loaves. Let cool on a wire rack. Enjoy! It’s a crookneck squash, and it is gigantic! It is about the size of 3 or 4 butternut squashes! So you will likely be seeing this, or parts of it, a few times over the next few weeks. This recipe used just 1/2 of the bulb section. We also dove into out CSA box and pulled out some collard greens. My daughter and I had been to one of my favorite Persian kabob restaurants in DC today, so I wanted a light dinner. 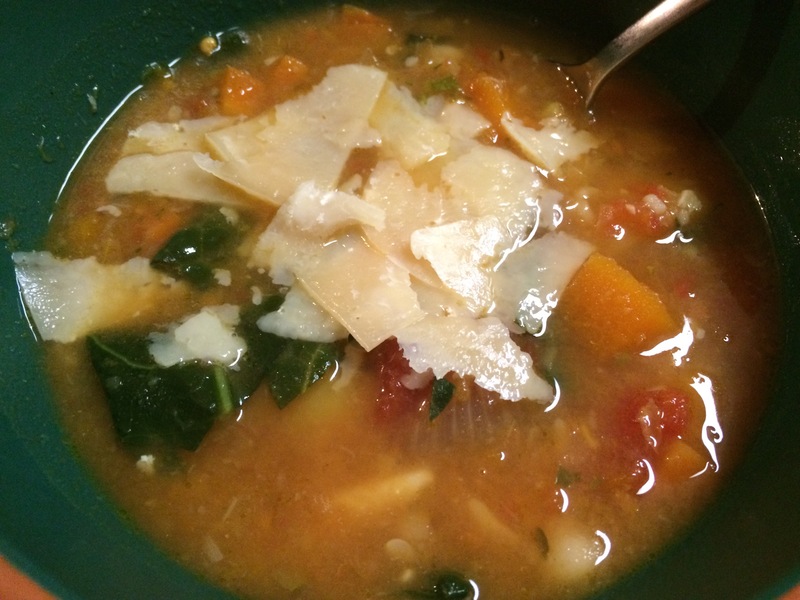 Time for some minestrone soup. When you look at my pictures below, feel free to chuckle at the size pot I used. I don’t know what I was thinking. Heat olive oil in a large pot over medium-high heat. Add onions and carrots and saute 3 minutes then add garlic and saute 1 minute longer. Stir in vegetable broth, potatoes, squash, zucchini, tomatoes, rosemary, thyme, bay leaves, pamesan rind and season with salt and pepper to taste. If you want a thicker soup, use an immersion blender for about 10 seconds. Serve warm topped with shaved parmesan cheese. Enjoy! The fall vegetables in my garden did not grow very well. Aside from the parsnips, which need a few more frosts before I can harvest them, and the sweet potatoes, which were fantastic, the rest has been a total loss. There are a few anemic leeks that may yet get eaten, but the weather and a new groundhog took care of the rest. So it is time to rely on my local farmers. I joined a CSA for the first time, specifically for fall goodies. The first basket included cauliflower, broccoli, cabbage, lettuce, apples, honey, apple cider, etc. So tonight, we use some locally grown broccoli. And some locally raised and butchered beef! Although we don’t eat beef often, when we do, it mostly comes from our local butcher, fresh from our local farms. 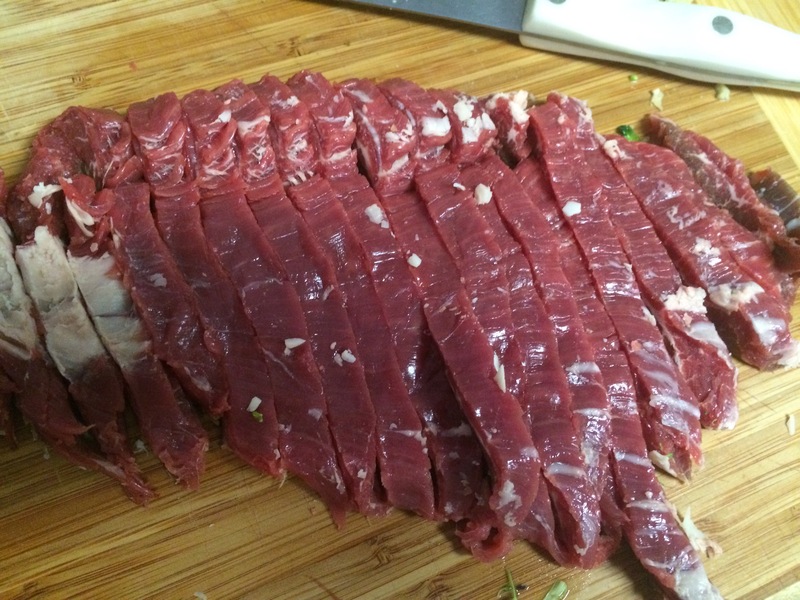 Today is was a flank steak. 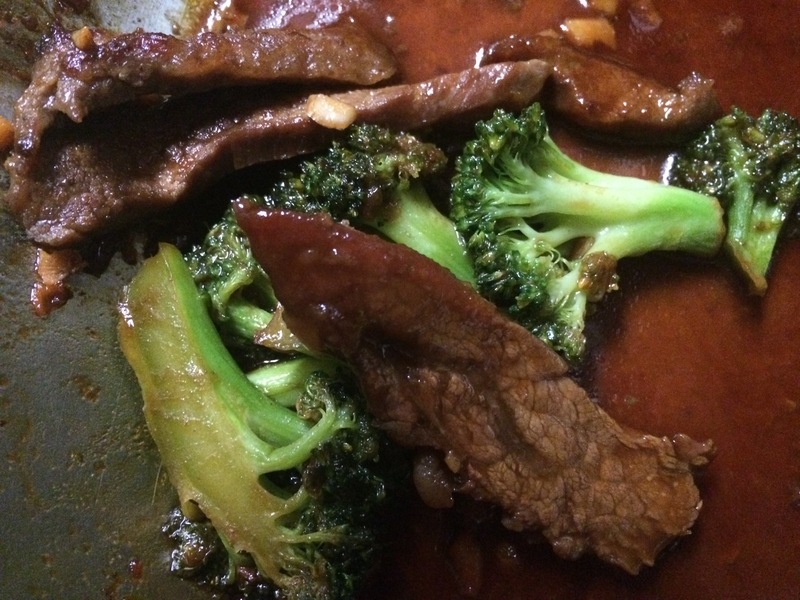 Beef and broccoli, such a standard order in chinese takeout. But add some hoisin sauce and brown sugar and you have a delicious, fast dinner. And no delivery fee, but the cook will always accept tips :). Note: Remember to slice the beef across the grain. In a large skillet over medium-high heat, heat 1/4 cup oil. 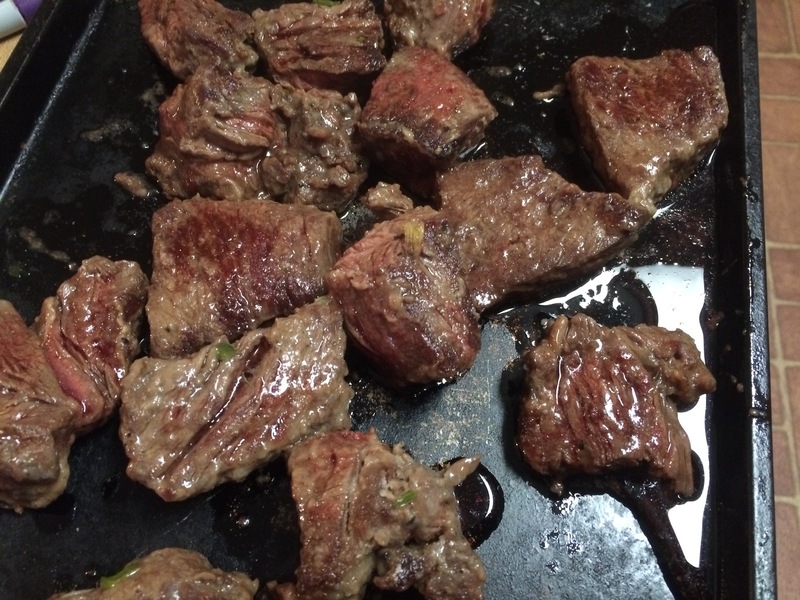 Toss beef with corn starch. Cook until crispy, 2 minutes per side. 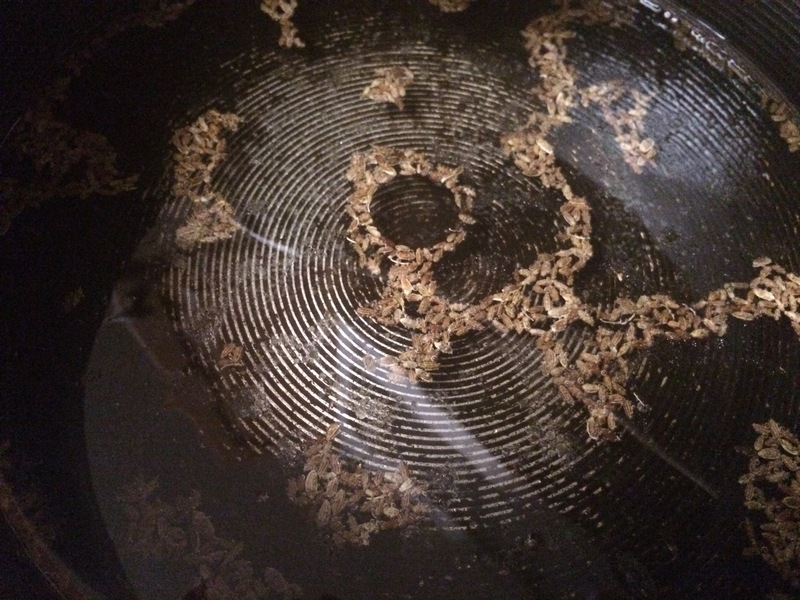 Transfer to a plate and drain fat from the pan. Add remaining teaspoon of oil to skillet. Add garlic and ginger and cook until fragrant, 1 minute, then add hoisin sauce, soy sauce, brown sugar, and water. Bring to a simmer and let thicken, 4 to 5 minutes, then add broccoli. 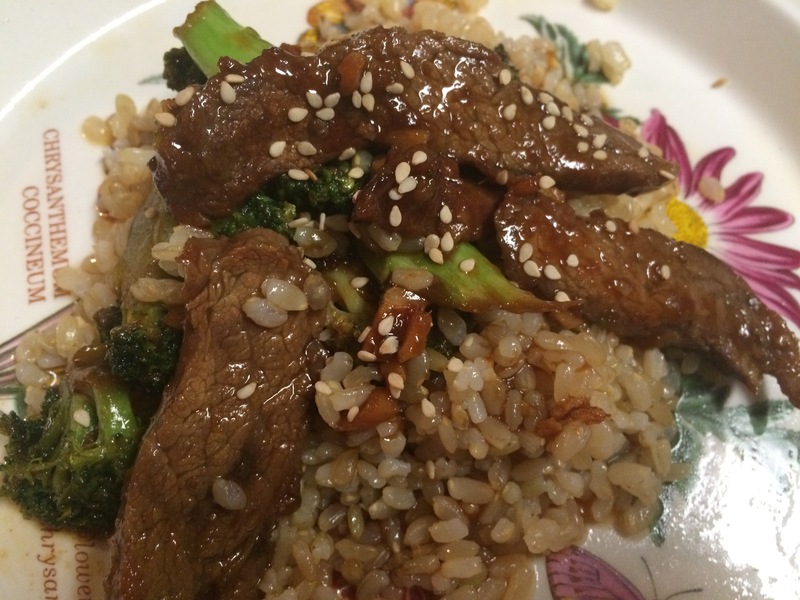 Cover and cook until tender, about 3 minutes, then return beef to skillet and stir until completely coated in sauce. Garnish with sesame seeds and serve over rice. Enjoy! 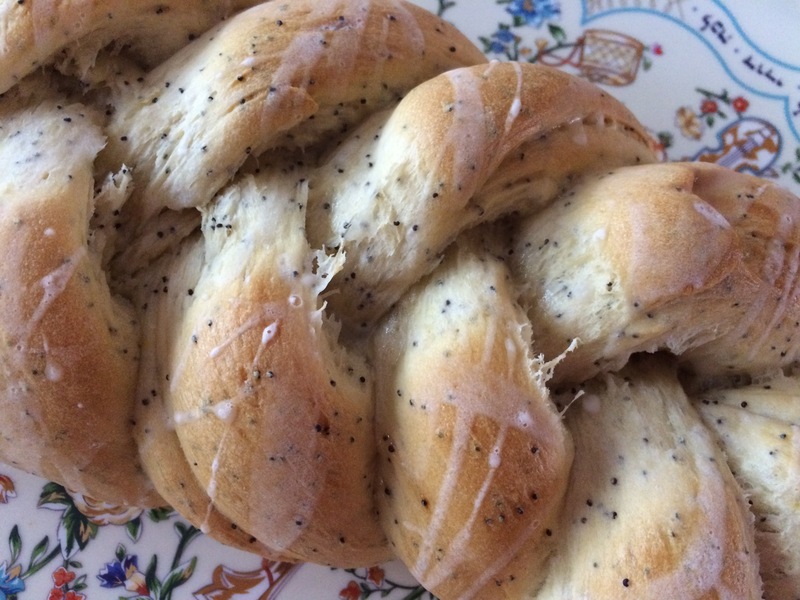 Time for a challah that will make a great breakfast bread. I love lemon poppyseed cake, so I was very excited about trying this. 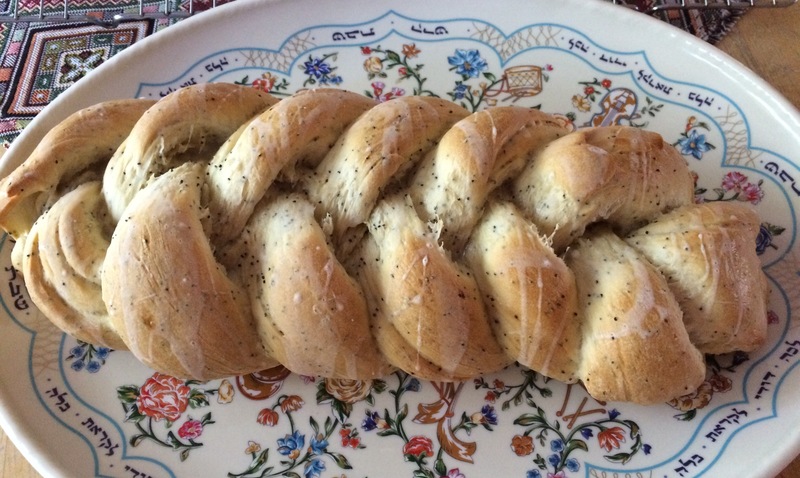 It was a very easy dough to work with and produced a wonderfully light, fluffy bread. The icing added a nice sweetness to balance the tang of the lemon. 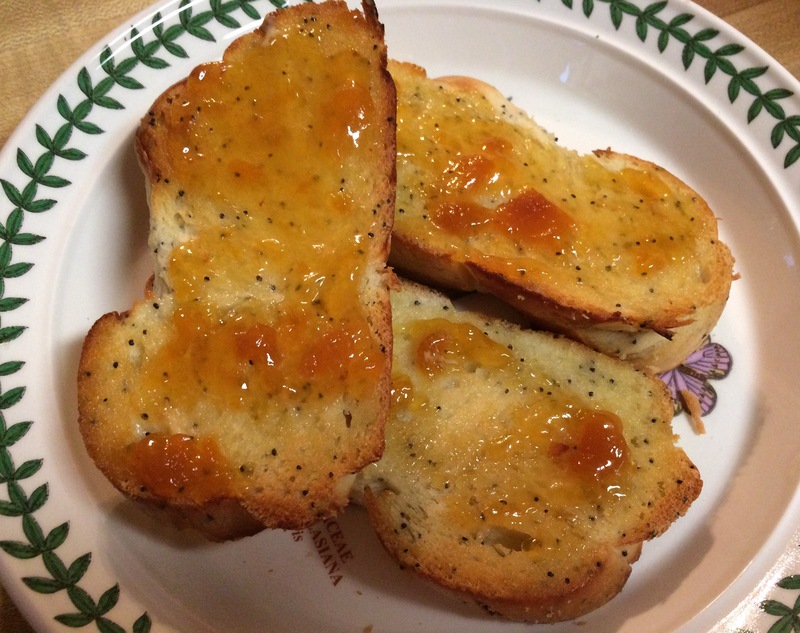 It was a wonderful breakfast, toasted with butter and jam. Proof the yeast in warm water with 1/2 tsp sugar. While the yeast is proofing, zest the lemon and squeeze out the lemon juice. When the yeast is foamy (about 10 minutes), mix in the egg, oil, zest,and juice. Mix with a wooden spoon. Add the flour, salt, and poppy seeds. Place in a stand mixer. Knead for about 7 minutes. This dough is a bit wetter than most of your doughs and may feel heavier, but it should not feel sticky. Place in an oiled bowl and let rest until doubled in size, about an hour and a half. When the dough has doubled, punch down and braid as normal. I did a 4 strand challah. Let rest an additional thirty minutes. Egg wash and bake at 350 for 25-30 minutes, turning halfway. While your challah bakes, you can make the drizzle frosting. Cool the challah on a wire rack. Drizzle the frosting over the challah with a teaspoon.